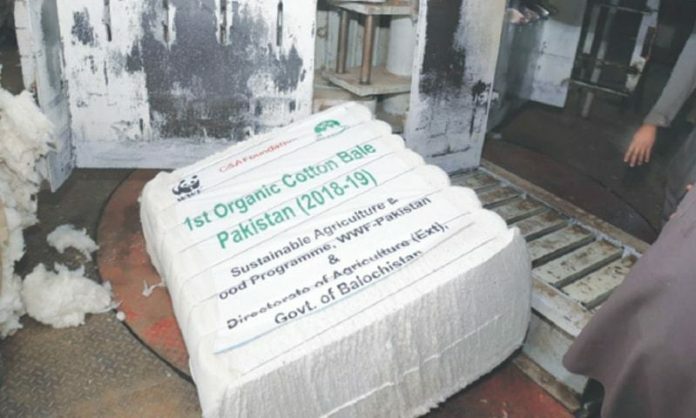 QUETTA: Balochistan has produced Pakistan’s first organic cotton bale, while the ceremony for its certification was held at Kot Sabzal, a local media outlet reported on Thursday. According to the World Wildlife Fund (WWF), the harvesting of the cotton bale was made possible due to the cooperation of Balochistan’s Department of Agriculture. Balochistan’s Agriculture Minister Engineer Zamrak Khan said the provincial government was committed to promoting organic agriculture throughout the province, adding that the government was paying special attention to Balochistan. He further said that the Balochistan government would be developing an organic agriculture policy soon. It is pertinent to mention that Pakistan is the fifth largest producer of cotton in the world and the third largest exporter of raw cotton. In his remarks, Balochistan Agriculture Secretary Khaleeq Nazar Kiyani appreciated the efforts of WWF-Pakistan and the Agriculture Extension team.